The Granville 'Automatic' is barely automatic. The word refers only to the fact that all basic functions, including line spacing and carriage return, were keyboard operated. Two large keys on the top sides were used as the carriage return and line spacer. 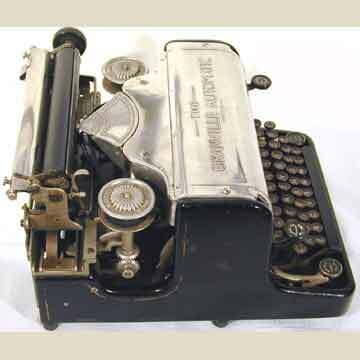 The Granville was the second thrust action typewriter designed by Bernard Granville. The earlier one was the Rapid. The Rapid, nor the Granville was much of a commercial success, making both machines very rare these days. See the pages about the Rapid and Granvill in the book â€œTypewriterâ€�, page 141.